We aim to dispatch all orders within the time frames below or sooner wherever possible. Returned orders due to Failed Delivery will incur an additional fee to resend the order. Delivery times can vary but most items will be received within 1-3 days of dispatch in the unlikely event that your order is not received within 7 working days please contact us. Please allow up to 21 working days for any lost/delayed parcels. UK Express / Next Day Delivery is available from Monday to Thursday and will require a signature upon delivery. All Orders placed after 1pm Thursday will be dispatched on the Next Working Day; if you do not receive the order within 1 working day of dispatch please contact us so we can chase up the order immediately. If you have any questions about our delivery services please contact us. We aim to dispatch all order within 1-3 working days. All orders placed outside of the UK will require a signature on delivery. Some overseas destinations may need to pay customs duties these are not included in the price and are the buyer's responsibility. 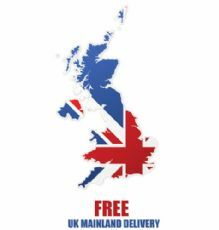 Delivery times outside of the UK will vary usually from 5-14 working days to be delivered if your item is not received within 28 working days please contact us. Should an order be returned to us for failed delivery we will have to charge a fee for repeat delivery. Please choose the correct delivery at the checkout. If you have any questions regarding these delivery services or need further information then please contact us, we aim to answer all emails with 24 hours.